With its excellent stay-in-grade performance, Moly Full Synthetic Gear Lube is recommended for automotive and enclosed gear drives including worm gear drives. Moly Full Synthetic Gear Lube is a fully synthetic, multi-purpose lubricant made with severely hydrofinished polyalphaolefin (PAO) base fluids. 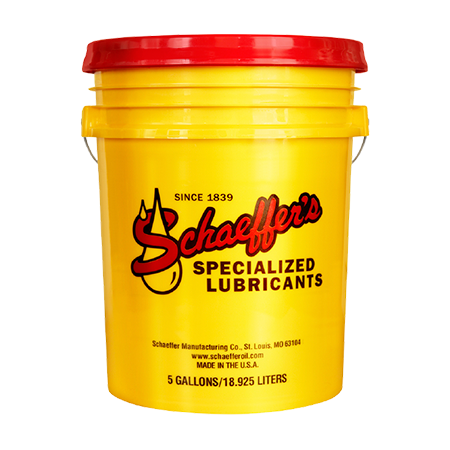 This advanced formula delivers thermal and oxidation durability and stability capable of withstanding temperatures up to 175°F higher than conventional gear lubes. Additionally, the PAO's low channeling and pour point allow Moly Full Synthetic Gear Lube to lubricate the bearings and gears at sub-zero temperatures the moment they start turning. Moly Full Synthetic Gear Lube is blended with our proprietary friction modifier, Micron Moly®, to create a fine, but highly durable shield on metal surfaces. As conditions intensify, our gear lube protects gears and bearings against excessive wear, friction and vibration. By reducing friction, wear and thermal degradation, Moly Full Synthetic Gear Lube extends equipment and fluid life and boosts energy efficiency. Extreme pressure properties to reduce excessive wear and fatigue. Increased gear and bearing life. Superior oxidation and thermal stability and durability. Better heat transfer; lower operating temperatures. Prevents soot and carbon deposits on gears, bearings and seals. Excellent hydrolytic and demulsibility characteristics. Compatibility with all types of seals.